Abdex has successfully delivered professional and adaptable training to a wide variety of small and blue chip companies. With our strategic training partners we continue to strive and consistently monitor our delivery to further improve our training courses. We are flexible to deliver and meet our customer's specific requirements, while still covering core elements of internationally recognised training courses. Abdex training courses are consistently rated above 91.2% for all aspects. This is a proven record we are very proud of considering the wide variety of International candidates, from beginners in the industry, to offshore engineers with over 30 years experience. 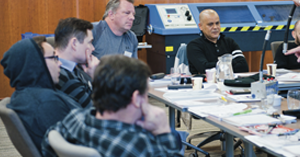 Abdex delivers training courses when and where the customer needs them. Training can be held at the customers venue or a dedicated training facility. Our dedicated training co-ordinator will take care of every aspect of your training requirements, the arrivals, transfers, venue, refreshments, overnight stays (if required) and most importantly monitor the delivery. Abdex have a long proven track record in training and helping people.